Zambia’s chiefs are the official custodians of vast areas of rural agricultural land that provides livelihoods for millions of rural farmers, as well as the game management areas that are home to forests and habitats for Zambia’s renowned wildlife. Chiefs have enormous powers to allocate land and, with their headpersons and advisors (indunas), to define what practices are permitted and by whom. Yet each chief has his or her own customs to follow and may have little knowledge of the decisions of their predecessors, as customary decisions are rarely recorded. As pressure for land increases and as city dwellers, investors, and even local governments search for virgin land to build on or develop, local farmers are at a disadvantage in protecting their existing rights to land. As a result, USAID is supporting chiefs and villages to systematically document boundaries and engage in participatory land use planning to protect communal resources like grazing areas and forests. USAID and its local partners are subsequently helping individual households to register household land with chiefs and village headperson. In addition to improving tenure security in chiefdoms, USAID has been supporting dialogue between chiefs and local government. 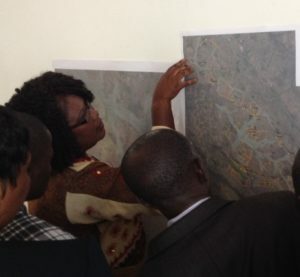 Local government has welcomed the chiefdom mapping work. “We used to help investors convert land from traditional use to leasehold, with only the signature of the chief. Now, we have more tools to ensure we do not convert land that is another family’s,” highlighted a local council secretary.